You are currently browsing the daily archive for October 9, 2018. The Brazilian general elections held on Sunday resulted in the most right-wing Congress since the end of the 1964-1985 US-backed military dictatorship and gave the fascistic former Army reserve captain Jair Bolsonaro a wide lead in the presidential contest. Failing to win an outright majority of the ballots, Bolsonaro faces a run-off on October 28 against Workers Party (PT) candidate Fernando Haddad. Bolsonaro won 46 percent of the vote, barely 4 percent short of a first-round victory. Haddad, a former mayor of Sao Paulo, came in a distant second, with 29 percent, corresponding to roughly 30 million votes. Abstention and spoiled ballots were at a record high, at 40 million votes, a significant figure considering that voting is mandatory in Brazil and repeated abstention is punished by fines, withholding of passports and, most importantly, exclusion from civil service. Twelve percent voted for Ciro Gomes, of the Democratic Labor Party, the oldest functioning bourgeois party in Brazil, which is the heir of the 1937-1945 corporatist politics of dictator Getúlio Vargas and is associated with bourgeois opposition to the 1964-1985 military regime. Geraldo Alckmin, of Brazil’s former traditional right-wing party, the Brazilian Social Democracy Party (PSDB), saw his party’s electoral obliteration, dropping from 48 percent of the vote in the 2014 run-off against the PT to only 5 percent in Sunday’s balloting. Marina Silva, a former PT environmental minister who since 2010 commanded the support of sections of big business such as the powerful heir to Brazil’s largest private bank, Neca Setúbal, saw her vote collapse from 21 percent in 2014 to only one percent. The elections were overshadowed by the worst economic crisis in Brazil’s history, with the GDP drop between 2015 and 2016 the largest since the 1929 crash, and the slowest recovery in history, with employment and median income projected by bourgeois economists to return to their 2013 levels only by 2027. The entire political system has been thoroughly discredited by the massive corruption scandal surrounding the state-run energy giant Petrobras, exposed in the so-called “Lava Jato” (Car Wash) probe, which has so far uncovered 12 billion reais (US$4 billion) siphoned from public funds into bribes and kickbacks. The scheme was further shown to be an integral part of the so-called “national champions” policy of favoring nationally owned industrial, infrastructure and agribusiness monopolies in the national and international markets, whose expansion was made possible by the late 2000s commodity boom. Having overseen the massive corruption scheme and the beginning of the economic crisis, the PT saw a wholesale desertion of working-class voters in regions it had historically dominated, mainly in the country’s industrial south, winning there by the smallest margin since it first came to power in 2002 with President Luiz Inácio Lula da Silva, popularly known as Lula. The collapse of support for the PT, combined with major youth and working-class protests against the brutal austerity and privatization program imposed by Lula’s successor, PT President Dilma Rousseff, beginning on the first day of her second term with the nomination of “Chicago Boy” Joaquim Levy as her finance minister, emboldened the far right to push for Rousseff’s impeachment in 2016. While her ouster was initially opposed by bankers, agribusiness bosses and industrialists as “disruptive,” it finally gained their support in order to accelerate the austerity program she herself had implemented. As the Car Wash probe developed, endless accounts by jailed businessmen of their corrupt relations with PT officials, including first and foremost Lula, provided further means for the weakening of the PT and finally, for the jailing of Lula himself. Lula’s conviction on the charge of receiving a beachfront penthouse in exchange for rigging Petrobras contracts further eroded the PT’s position, taking Lula out of the electoral race. While he initially was the front-running candidate for president, with 30 percent support, he also faced a 50 percent rejection by those polled, while a clear majority has indicated its opposition to his release from prison. Anti-corruption rhetoric, together with ultra-nationalist agitation against the “sale” of Brazilian assets to China and Chinese investments in African and Latin American countries (condemned as “handouts”), combined with tough-on-crime and anti-immigrant demagogy has served as the stock-in-trade of the far-right crusade against the PT. This has been consciously directed at the neglected working class, especially in declining or struggling industrial regions. The Car Wash probe became a major tool for a violent turn to the right. After Rousseff’s 2016 impeachment, her vice president and successor, Michel Temer, imposed a labor reform allowing unhindered contract work in companies while decimating health and safety regulations. His government later imposed a 20-year spending freeze through a constitutional amendment. In the face of every attack, the PT was unwilling and unable to mobilize the working class. Together with its affiliated trade union confederation, the CUT, it called off at the last minute a series of general strikes, even in face of immense working-class militancy, thereby strengthening the ultra-nationalist, far-right appeals to workers. With Brazil’s ruling class determined to wage a class war on workers, Bolsonaro has garnered decisive support from business circles, which used to swing between the PSDB and the PT, most prominently the so-called “Bible, Beef and Bullets” caucus which grew to comprise a third of Congress during the 13-year rule of the PT and provided its governments with decisive support for right-wing policies on many occasions. Most importantly, the caucus was the breeding ground for the fascistic Bolsonaro, who has held a seat as Rio de Janeiro state’s representative in the lower house for seven straight terms since 1991. In 1999, he stated his desire for “an audience” with then-Venezuelan President Hugo Chávez, declaring him “a hope for Latin America,” and stating that neither he nor Chávez were “anti-communist.” For these supposedly “nationalist” positions, Bolsonaro was not only tolerated in the PT-led congressional alliance, but considered an important vote against neoliberal measures that the PT government itself rammed through over more than a decade, such as the 2003 pensions reform, allowing him to fashion a fraudulent right-wing populist and nationalist appeal. Coming from Rio de Janeiro, a city the PT transformed into a virtual federal protectorate in order to build the infrastructure to host the 2014 Soccer World Cup and the 2016 Summer Olympics in the face of massive opposition to evictions, the under-funding of health and education and military operations in working-class neighborhoods, Bolsonaro was able to exploit a widespread perception of the PT’s betrayal of workers in favor of big business. He also appealed to fear of crime with extreme pro-gun, pro-military rhetoric—the signature gesture used by the candidate and his supporters has been pointing their fingers as if they were firing guns. Bolsonaro has called for making it easier for police to kill criminals, this in a country where cops killed over 5,000 people last year. Bolsonaro faces a 45 percent rejection rate in the polls, compared to 40 percent for his PT adversary, Haddad. If this widespread rejection proves enough for Haddad to defeat him on October 28, the result will be a return to power by the PT at the head of the most right-wing government since the end of the military dictatorship. 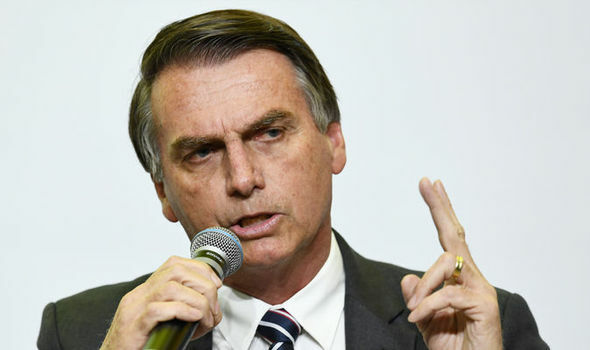 Bolsonaro has indicated that his defeat at the polls would be illegitimate and has openly appealed to the military—which has recently intervened in politics in a manner unprecedented since the end of the dictatorship—for support. While appealing to big business for support and seeking to cobble together an “anti-fascist alliance” embracing demoralized right-wing “democratic” politicians in the PSDB and even discredited media conglomerates that have carried anti-Bolsonaro reports, such as the right-wing O Globo network and Vejamagazine, the PT, a thoroughly bourgeois party, is neither able nor willing to make any class appeal to the working class. The PT’s policies will only strengthen the far right and heighten the threat of a return to an even bloodier dictatorship than the one that ruled the country for two decades beginning in 1964. The only answer to these dangers is the building of a new revolutionary leadership in the working class through the construction of a Brazilian section of the International Committee of the Fourth International.